Laboratory of Nanotechnology and Solar Energy, Chemistry Institute, University of Campinas (UNICAMP), P. O. Box 6154, CEP 13080983, Campinas-SP, Brazil. Polymer solar cells (or organic solar cells) are among the most promising devices for cheap solar energy conversion. The classical device consists of a bulk heterojunction based on a conjugated polymer and fullerene network. Many research groups have focused on the replacement of the fullerene derivative with carbon nanotubes or inorganic nanoparticles, due to the easily tunable properties of these materials, such as light absorption, structure and charge carrier transport. 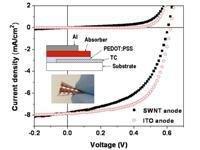 In this article, we highlight the recent progress on the incorporation of carbon nanotubes, wide bandgap semiconductors (metal oxides) and quantum dots into bulk heterojunction polymer solar cells.